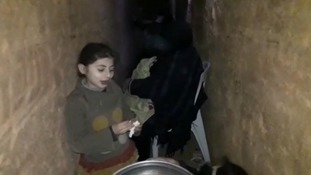 Reporting from the scenes of chemical weapons attacks, to documenting families sheltering in tunnels during bombing raids, Humam Husari has shown the outside world the reality of life in Syria during its more than seven-year civil war. For fours years, Mr Husari has brought remarkable footage of ordinary Syrians trying to stay alive to the outside world. More than 500,000 people are thought to have been killed in the country's civil war, with six million people displaced inside Syria, and a further 5.6 million people fleeing the country, he has reported on lives torn apart by war. From highlighting the plight of children injured in the war, to sending ITV News the first independent footage of a chemical weapons attack in Zamalka in 2013, the majority of Mr Husari's stories do not have happy endings. But finally, one of his stories does have a happy ending: his own. After five years, and along with his new wife, Mr Husari has finally been reunited with his parents in Turkey. However, he says, making the decision to leave was not an easy one, and he feels guilt about those he has left behind. "I'm really very relieved that we are safe, finally, but I am still always thinking about a lot of the people I have met," Mr Husari explains. "I feel lucky, but at the same time I still think: 'What about them'." As President Bashar Assad's forces strengthened their grip on Syria this spring, Mr Husari was forced to go on the run. After a ceasefire was announced in Douma, he was able to escape to the relative safety of Idlib province, but as air strikes increased, they were left with no option but to flee their home country, eventually arriving in Istanbul. For a journalist who put himself at the very heart of civil war, documenting a country which has disintegrated with a huge human cost, his story is of one family which has come back together.